“This is the best pie I ever ate…” A sentence from my boyfriend… a rare sentence, which I actually never heard before. Especially since he is a big fan of my savory dishes but often rolls his eyes when I create a new dessert. But not this time! He seriously LOVED this blueberry cream pie and almost ate the entire cheesecake by himself. Well at least I could grab 2 small pieces and I can confirm that this pie is delicious! I always get excited when I can buy fresh blueberries in the store because I have so many ideas for blueberry desserts. Blueberries are simply delicious, healthy and pretty. I used them to make the yummy blueberry lime compote which adds this special note and underlines the taste of the cream layer. This blueberry cream pie recipe is vegan, gluten-free, refined sugar-free and easy to make. 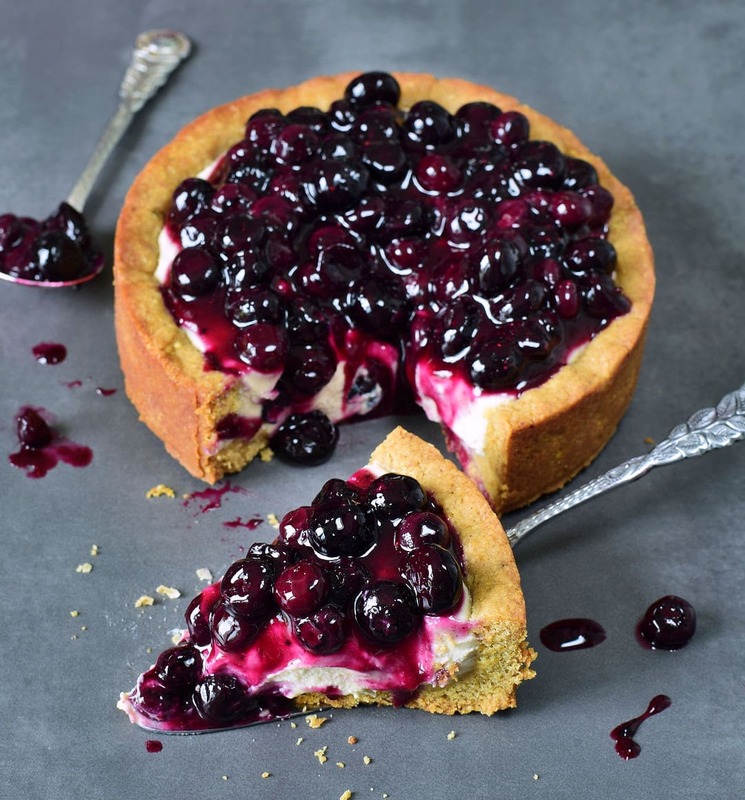 The crust of this healthy blueberry cream pie contains almond flour, oats, nuts or seeds of choice (you could use peanuts, hazelnuts, macadamia nuts, sunflower seeds etc. ), a liquid sweetener like agave syrup or maple syrup, and vanilla extract. The cream layer contains soaked cashews, tofu, a liquid sweetener, coconut milk, lime- or lemon juice and vanilla extract. You can use silken tofu or regular tofu, both work well. You could also increase the amount of cashews and leave out the tofu if you can’t eat soy. Or you could use coconut yogurt or vegan cream cheese instead, however, the cream layer will turn out less firm. Furthermore, I really love how the cream layer of this blueberry cream pie came out with the cashew/tofu combination. The blueberry compote contains blueberries, lime- or lemon juice, a liquid sweetener and I also added a teaspoon of maqui berry powder. This is optional but it adds a very lovely color. I once also used it to naturally color the purple layer of my raw vegan blueberry cheesecake. This vegan blueberry cream pie is perfect for a Sunday brunch but it’s equally great for a birthday. So if you got really excited and hungry now, then make this pie for the weekend, I am sure you will love it as well. 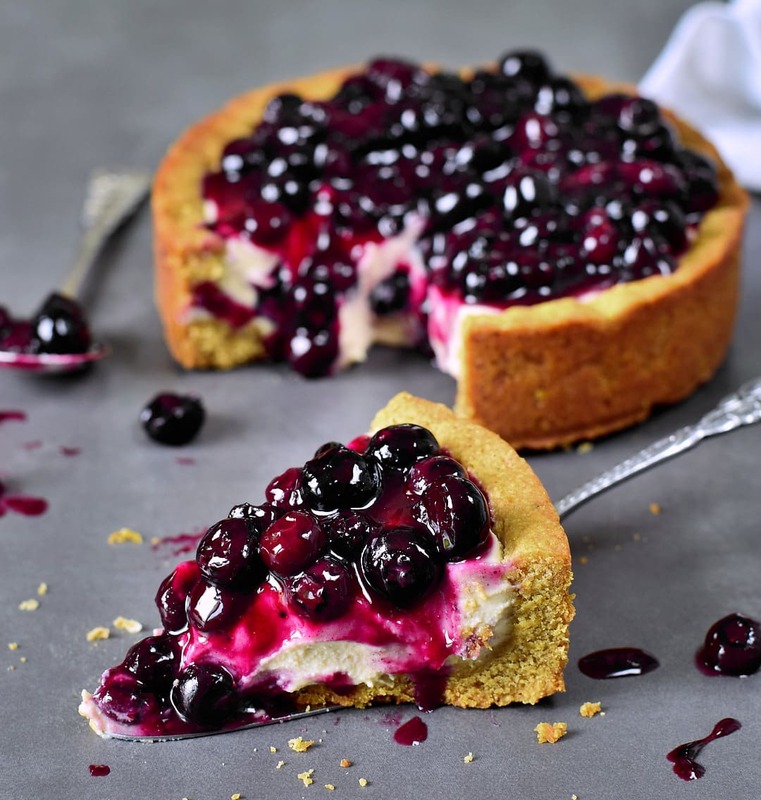 Please leave a comment below if you make this blueberry cream pie. You can also make a photo of it and post it on Instagram (or send me a DM). If you tag me in the caption + photo with @elavegan and use the hashtag #elavegan I will gladly check out your post and leave a comment. 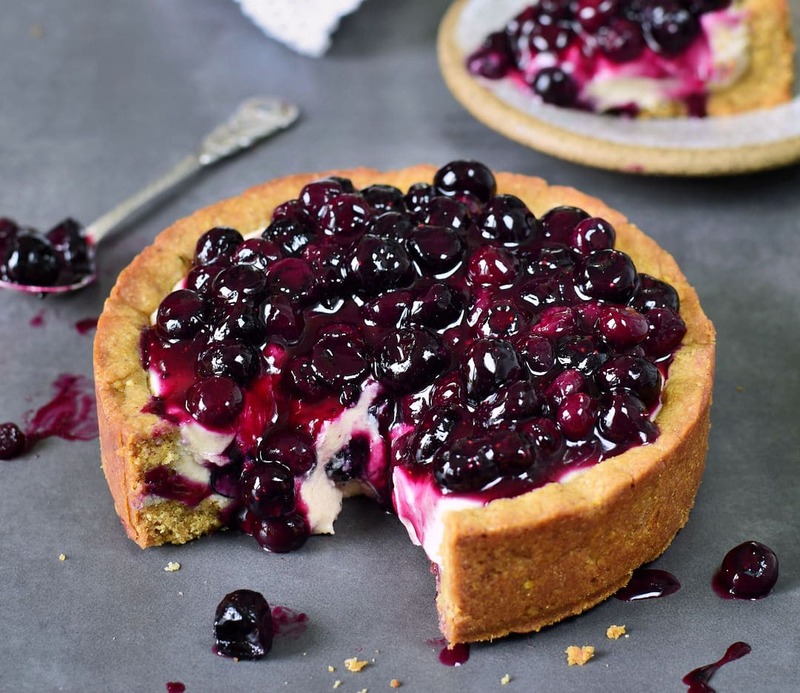 This blueberry cream pie is vegan, gluten-free, refined sugar-free and easy to make. It's the perfect dessert if you love to eat a healthy cheesecake without dairy or eggs. Easy recipe with simple ingredients. *You can use any nuts/seeds of choice, e.g. peanuts, hazelnuts, macadamia nuts, sunflower seeds etc. **Please read the blog post if you need a substitute for tofu. Is there any substitute for OATS? Allergy alert. Thanks. This cake looks so delicious Ela ???? 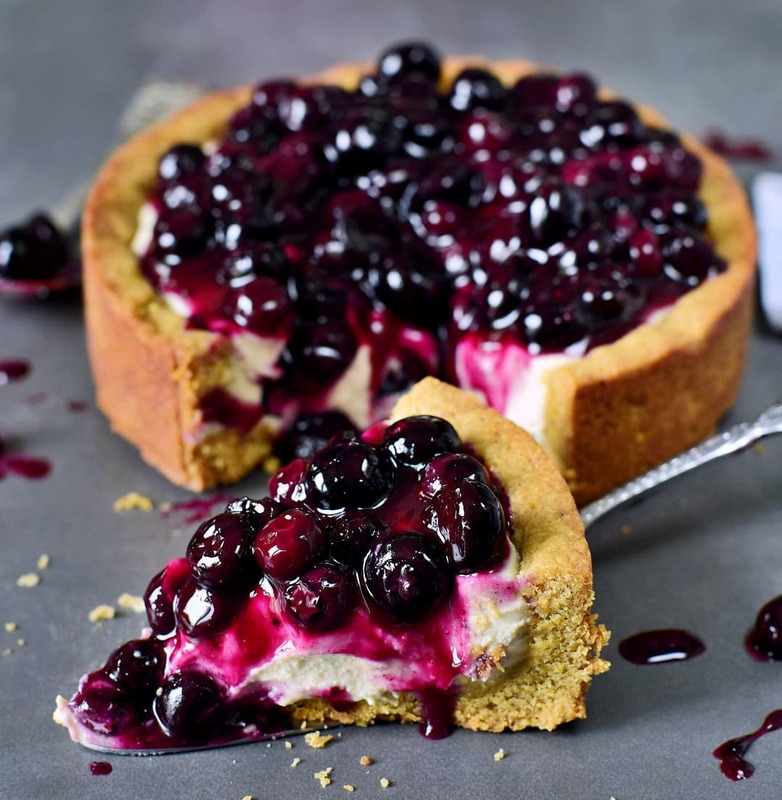 I love this combo with a almond crust, cream layer and blueberries ???????? I think this could be one of my favorites! Thanks for making me hungry ???? This cake is extraordinary, Ela! I love that the filling has tofu and cashews – must be extra creamy! Wishing you lots of love and congratulations on 300K! Hi Ela. Its going to be my first time attemping to make chesse cake. Do you use a special pan to bake the crust? How did you get the crust in that shape. Maybe its a foolish question but i had to ask! ???? Thank you for the wonderful recipes Ela! Thanks for sharing! I love that this is free of all those things! Does it keep very long? Do you think this could be split into mini tartlett/ pies? Would love to made individual pies! Looks so good! Just made this for Easter(tomorrow)! Excited to share as I have a few family members who are vegan. Quick question about the freezer process: I just made it a put it in the freezer, but once the hour is up, should I continue to store this in the freezer and take it out a couple hours before serving? Or put it in the refrigerator once it has set in freezer for the hour? Looks so good! Can’t wat to try it, thanks for the recipe!! Hi I’m making this for a vegan friend. Just did the filling but it looks a little runny. Is it meant to be that way? Will firm up in the freezer? Or should I add something else to firm it up? Thank you and sorry for all the questions.???? Made this yesterday, delicious! Creamy and super yummy! Thank you for sharing your recipes with us! Hello! I sm new to your blog, snd found this amazing looking pie. One quick question. What can you substitute for the coconut milk to keep it from being too thin? Would soy milk or almond milk work? Thank you for this great recipe. I made them into little tartlets. They were really sticky even though I kept dipping my hands in water so I added some water into the pastry dough (blended in the food processor). As a result the pastry was a bit chewy after it was baked. I loved the filling though (I put 10g less maple syrup and found it sweet enough and didn’t put any syrup with the berries). I would use the filling as a parfait filling next time and top it off with granola/crumble instead. I’ve been eyeing this recipe for a while now and I think I’m ready to make my first vegan cheesecake ever soon! One question though: do you think I could replace the agave syrup/maple syrup with either honey or brown sugar? It’s just a question of taste, I don’t use agave syrup and I don’t think I would like the taste of maple syrup in there. 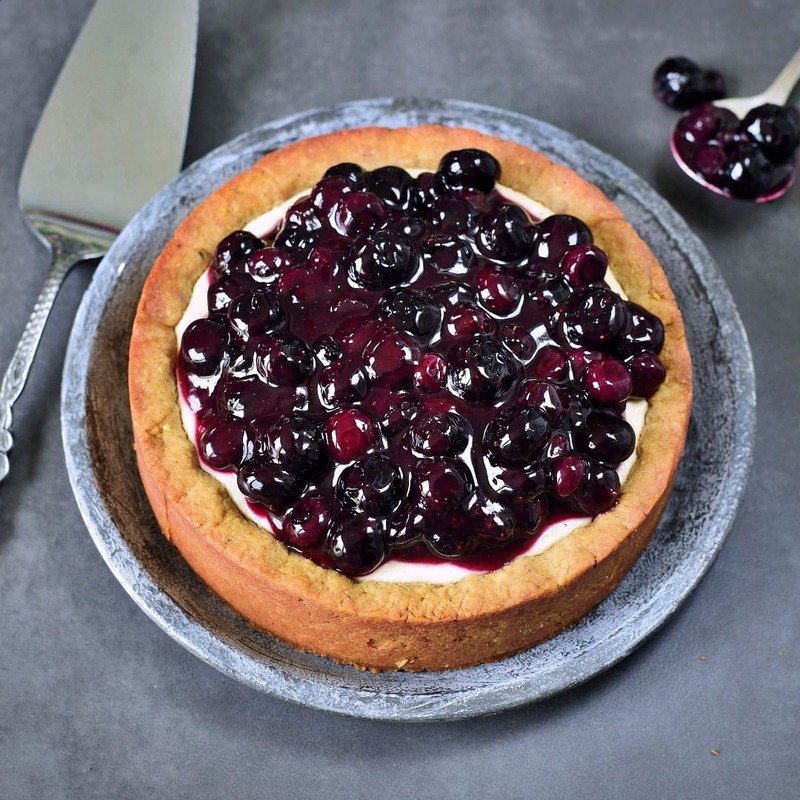 I’m also planning to mix the blueberries with some of the cream instead of doing the compote, but I’ll be using frozen ones so I won’t be able to put the cream to set in the freezer, will it also set in the fridge? Sorry for all the questions and thanks a lot!! Hello Laura! Yes, you can use honey. The cream is pretty soft and it probably won’t set in the fridge (except if you add agar agar). I have a nice amount of frozen raspberries and gooseberries. Do you think they will fit? How do I work with frozen berries? Raspberries and gooseberries sound lovely. I would use the frozen berries the same way as if they were fresh. 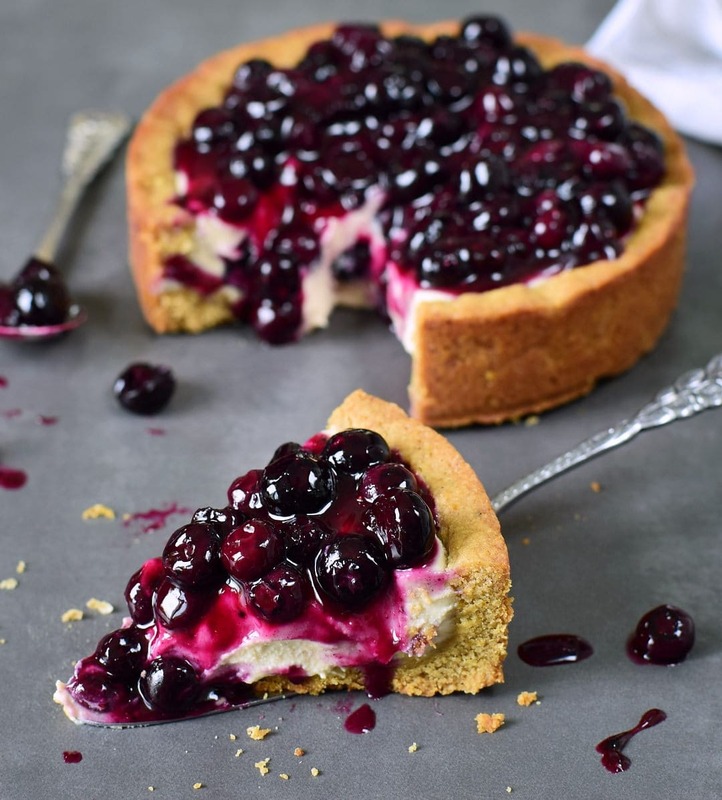 I am about to make this but was wondering for the topping if i can use Acai berry powder instead as i cant find the other powder. I love all your recipes i have made your chocolate zucchini cake and caramel brownies and they are gone so fast. Yes, sure! Acai berry powder is fine as well!